Challenge Soccer Club is excited to announce we've launched a new division. Challenge Southwest -- Serving the Sugar Land, Bellaire, Sienna Plantation and surrounding areas. 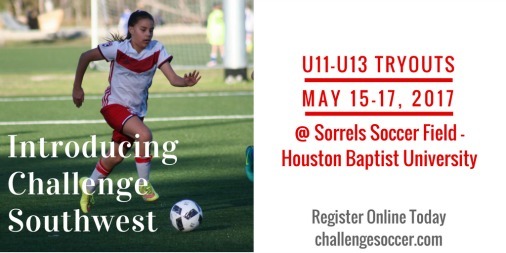 Our Challenge Southwest teams will train at Sorrels Soccer Field located on the campus of Houston Baptist University. We are also excited to announce two new additions to our Professional Coaching Staff -- Chris Meyer and Jesse Martinez, who will spearhead the Challenge Southwest division of the club. Click HERE to be directed to the online registration page.